Robert Owen, the son of a saddler and ironmonger from Newtown in Wales, was working in Manchester that he heard about the success Richard Arkwright was having with his textile factory in Cromford. Richard was quick to see the potential of this way of manufacturing cloth and although he was only nineteen years old, borrowed £100 and set up a business as a manufacturer of spinning mules with John Jones, an engineer. In 1792 the partnership with Jones came to an end and Owen found work as a manager of Peter Drinkwater's large spinning factory in Manchester. Owen toured the country making speeches on his experiments at New Lanark. He also publishing his speeches as pamphlets and sent free copies to influential people in Britain. In one two month period he spent £4,000 publicizing his activities. In his speeches, Owen argued that he was creating a "new moral world, a world from which the bitterness of divisive sectarian religion would be banished". His criticisms of the Church of England upset many people, including reformers such as William Wilberforce and William Cobbett. One of the most important campaigners against child labour was Frances Trollope. In 1839 Trollope decided to write a novel on young factory workers. She had become interested in the subject after reading a copy of the book on the life of Robert Blincoe in 1832. Before writing the novel she carried out a fact-finding mission to Manchester. Frances Trollope was accompanied by the French artist, Auguste Hervieu, who had been commissioned to produce illustrations for the book. Trollope and Hervieu spent several weeks visiting factories and having meeting with people involved in the campaign for factory reform. This included Richard Oastler, Joseph Raynor Stephens and John Doherty, the editor of The Poor Man's Advocate. The first part of Michael Armstrong: Factory Boy, was published in 1840. Frances Trollope was the first woman to issue her novels in monthly parts. Costing one shilling a month, it was also the first industrial novel to be published in Britain. The conservative The Athenaeum, gave it a hostile reception and compared Trollope to James Rayner Stephens: "The most probable immediate effect of her pennings and her pencillings will be the burning of factories and the plunder of property of all kinds. The Rev. James Rayner Stephens has recently been sentenced to eighteen months imprisonment for using seditious and inflammatory language. The author of Michael Armstrong deserves as richly to have eighteen months in Chester Gaol. But if the text be bad, still worse are the plates that illustrate it. What, for instance, must be the effect of the first picture in No. V1 (mill children competing with pigs for food), on the heated imaginations of our great manufacturing towns, figuring as they do in every book-seller's window." Abraham Whitehead was a cloth merchant from Holmfirth who joined the campaign for factory legislation. 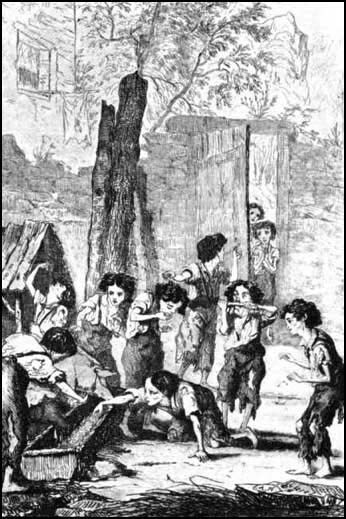 He told a parliamentary committee in 1832: "The youngest age at which children are employed is never under five, but some are employed between five and six, in woollen-mills, as piecers.... I have frequently seen them going to work between five and six in the morning.... 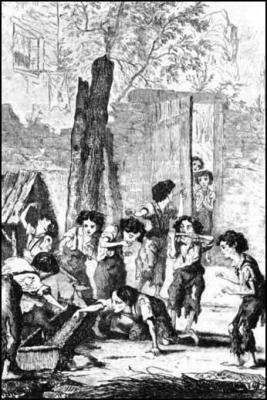 They get their breakfast as they eat; they eat and work; there is generally a pot of water porridge, with a little treacle in it, placed at the end of the machine." He was concerned about the impact the work was having on the children. "I have seen a little boy, only this winter, who works in the mill, and who lives within two hundred or three hundred yards of my own door; he is not yet six years old, and I have seen him, when he had a few coppers in his pocket, go to a beer shop, call for a glass of ale, and drink as boldly as any full-grown man, cursing and swearing."